We are delighted to bring the news that you can now listen to (and buy!) 1912 music on Bandcamp and the recently-launched YouTube Music. 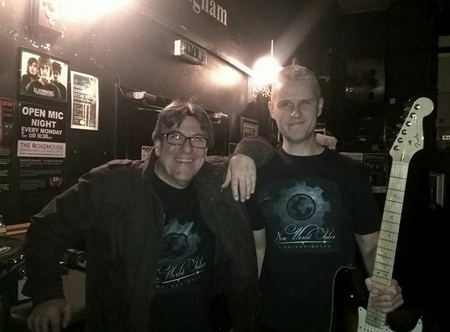 We'd like to thank our good friend Lee Potts (of Omenopus and Monty Maggot Records) for making much of this happen. All three albums are now available on Bandcamp, and we hope to have the 4-track Live EP available there soon as well. May - July 2018: Recording sessions for a new album. 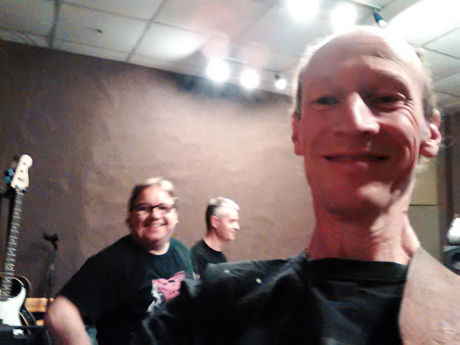 With a shedload of new songs in the bag, we returned to Robannas to start recording tracks for a new album - our fourth, and the first to be recorded with the new sonic forces in the band. Mig Seco was at the helm of the Pro Tools mothership - making sense of the weird noises we were giving him. Meanwhile, nature was busy trying to drown us out with some heavy thunder that was loud even inside an insulated studio control room. During a break in the process, we had a little jam session, which Mig was able to capture for posterity - the basis of a possible new song! * There will be a new, augmented version of "Eyes Shine Bright" (which we recorded live last year). 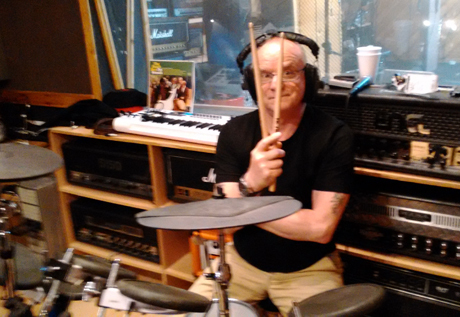 * In a change to how we normally do things, Doug has recorded all his drum parts using an electronic kit. Although many other artists now used electronic drums, we weren't sure if this would work for us, so it was a bit of an experiment. So far - thumbs up! September 2017: Alex is back! As some of you may know, Alex has been unable to be a part of the band for the last year or so, for medical reasons. But the good news is - he's now BACK! 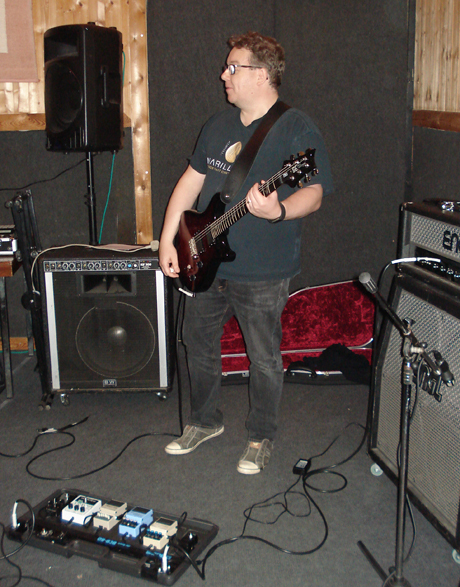 In a twist to the plot though, Al has taken on a new role in the band: whereas before he mainly played keyboards, now he joins Gavin on guitar duties; so we have a powerful twin-guitar sound that will take us in a bold new direction. Alex has already brought some new song ideas to the table, and everyone else is also busily writing new material. We suspect that a whole new album may not be too far away. . .
As promised, we recorded a set of four songs to showcase the current four-piece band line-up and heavier sound. We booked a day at Robannas and laid down these four tracks, with all instruments played and recorded simultaneously. So these are exactly as we'd perform them live, with only minimal post-production and mixing. After spending considerable time in rehearsals honing our new - heavier - sound, we will be going into the studio (Robannas, of course!) during August to record a brand new song "Eyes Shine Bright", along with new versions of older songs that have been reworked for the band's current 4-piece line-up. Just for a change, we'll be trying a different recording method - going for a "live" style recording, with everyone playing simultaneously and few or no overdubs. We hope to make the recordings available here as downloads, and also as a 4-track CD which will be available at our live shows. The reworked songs will be "Maybe I Lied", "Partial View" and "Square The Circle". We are now celebrating ten years together as a band! Our first show in FIVE years (EXACTLY five years too - our last show was at the same place on 23rd October 2011!) went well. It was our first venture out as a 4-piece, which was necessitated by Alex needing some long-term convalescence (hope the op goes well Alex!). We did some reworked versions of songs from the whole back catalogue. Gary stepped up to the plate to cover some of Al's keyboard parts on his trusty Nord. Spurred on by this success, we hope to do some more shows very soon. Thanks to Lee, Sonya, Kate, Liam and Martin for recording various aspects of the show. Here's one of Lee's shots, taken before we went on. . .
We might have some left. Contact us if you're interested! Autumn 2016: we have a GIG on Sunday, 23rd of October! We will be supporting ELIGH TOADD. We would be most delighted to see you all there. September 2016: New World Order now at a bargain price! From this month, you can buy New World Order direct from Monty Maggot Records for the amazing price of just £4.99. That's two discs for under a fiver! We now have a "taster" video for the New World Order album. We have just set up a profile on music sharing site Soundcloud. 1st February 2016: "New World Order" is released! 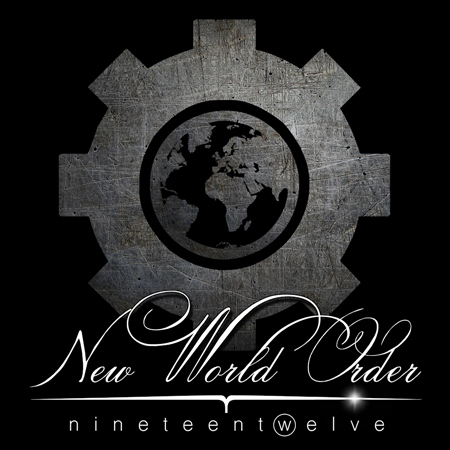 As you may have seen on our Home page, 1912's third album "New World Order" is released today! You can find the album for sale over at www.montymaggot.com, and also at international online vendors such as Amazon and CDBaby. Don't forget: it's a DOUBLE CD SET - with a second CD featuring Omenopus reworkings of 1912 classic tracks. Unmissable! Also check out "Life On Film", featuring live footage taken at the 23rd October 2011 show at The Roadhouse. If you run a venue in the Birmingham area and would like us to come and play, please contact us! All artwork and packaging design for "New World Order" has been completed now. We asked our friend and frequent collaborator Lee Potts (of Omenopus) if he could design us a cover, and gave him free rein. Well it's paid off, because he's come up with a stunning design! The low-res preview image below will give you some idea of how good it's going to look. . .
A select few people have already heard some of the new music, and the reaction has been overwhelmingly positive, with many saying that this is 1912's best album to date! The album will be released as a DOUBLE CD set, with the second CD featuring some amazing new music by Lee and Omenopus, all based on original 1912 tracks. We hesitate to use the term "remix" because these pieces of music go so much further than that term implies. "Re-imagining" is a more accurate description, as Lee weaves the new tracks together with specially-recorded narration to form a compelling science fiction story, which also manages to link into some of the themes of NWO. It's called "The Hybrid Project". 31st October 2015: Mastering complete! 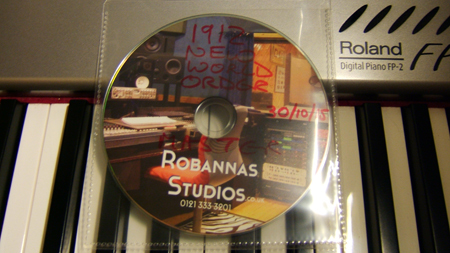 We have it at last: a completed Master Disc of "New World Order", the third album from 1912! It's been a long time coming, but we think you'll find it was worth the wait! Many thanks to Miguel Seco at Robannas for recording, mixing, editing and mastering this album - and for his many other contributions to this project. 2014/2015: at last, the 3rd album - and more! Sorry for the lack of any news for over a year! So to make amends, here's a round-up of what's been going on in 1912-land. We have been busy writing and recording material for our 3rd album, but it's taken a great deal longer than anyone would have thought! 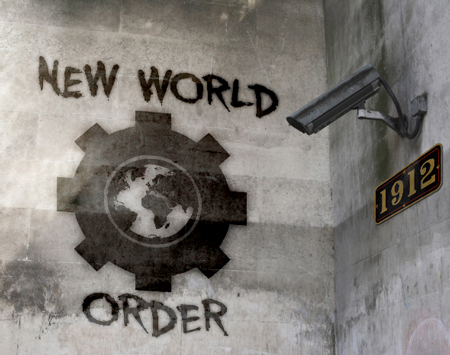 The good news is that the long-awaited 3rd album - now titled "New World Order" -is almost complete. All tracks are now recorded and mixed. We feel that this is our strongest album to date, with some killer tunes; the title track alone is going to blow you away! 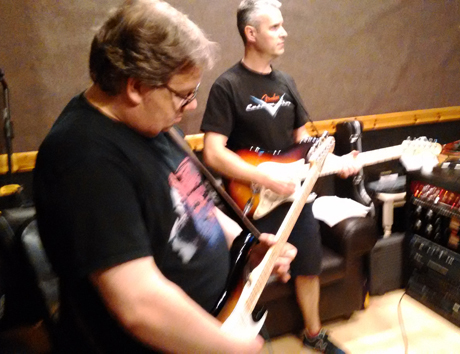 Due to the unusual circumstances of the recording, the band found an opportunity to explore new ways of writing, arranging and recording the music, so expect to hear some quite different sounds, styles and moods. 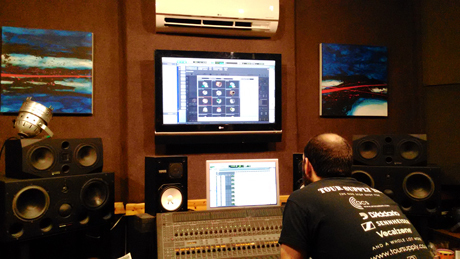 Right now, our engineer Miguel Seco is completing the mastering at his studio in Portugal. This should be completed in a few days. More good news: our friend and regular collaborator Lee Potts (of Omenopus) has agreed to help out with the release of the album in a number of ways. Firstly, he's sourcing the duplication; secondly, he'll be releasing the album on Monty Maggot Records (as with the first two albums); thirdly, he's designing the cover and packaging (so expect to see some excellent artwork! ); fourthly - and this is where it REALLY gets exciting! - he's created a CD of remixes of 1912 songs, which may form part of the release package, or may be released as a separate album altogether. "Remix" is a term that doesn't do justice to this project. The new tracks are more like "re-imaginings" of classic 1912 songs, with new arrangements and whole new sections. 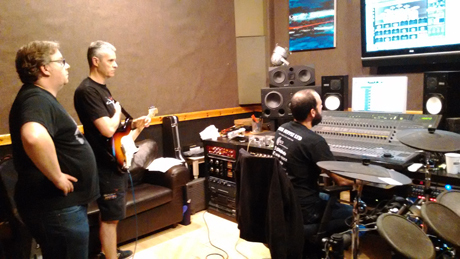 Lee has enlisted the help of a guest or two, and members of 1912 have recorded new parts for some of these tracks. Effectively, this CD (working title: "Hybrid") will be the next Omenopus album. So, we leave you with a visual teaser for the new album (note: this is NOT the cover artwork). . . The band (minus John, who's still knee-deep in nappies!) are now recording tracks for their next album. Due to the slightly unusual circumstances, these tracks sound quite different to anything 1912 have done before. Winter 2013: "Elegy" and "Waiting for No One" now available as a bargain package! Now for a limited time, you can buy both "Elegy" and debut album "Waiting For No One" direct from Monty Maggot records at the incredible price of just £4.99 for the pair - and this even includes postage for UK customers! September 1st 2013: "Elegy" released! 1912 are pleased to announce that their 2nd album "Elegy" is now available.It's been a long time arriving, but we feel that the wait has been worthwhile. The album builds on the strong grounding of its predecessor "Waiting For No One", yet brings in new sounds, moods and styles. You can find more details on the Music page. As the new album includes a track called "Brueton Park", we have been featured in this week's edition of Solihull News. This is in recognition of Brueton Park being a well-known landmark in the Solihull area (and the track includes field recordings made at that location). Summer 2013: "Elegy" release date announced - pre-release copies available soon! The long-awaited second album "Elegy" is finished, and is being duplicated for distribution. As before, the album will be available through our friends at Monty Maggot records, and eventually also through the usual online stores. The official release date is 1st September, but we hope to have some pre-release copies available to fans before that date. So, how do you get hold of one of these? Keep watching this space for news, and join our mailing list by sending us an e-mail! See the About page for our contact address. More details about the new album will appear here soon. Editing and mixing has taken longer than expected (not helped by the weather! ), but is now complete. The final mixes sound incredible, so we know you're going to enjoy the new offering. Work on the cover design is still ongoing, but look out for an album release announcement here soon! We've done all the recording now. Mig will be busy over the next few weeks mixing the tracks while we use the rough test mixes to work out what order to place the tracks, and how to join them. Without wishing to give anything away, we can say that there will be a few surprises and contrasts amongst the material. This album is likely to be quite different to "Waiting For No One"! Release date not yet defined, but likely to be in the first quarter of 2013. The bones of the last six tracks for our 2nd album were laid down on 29/07/12 at Robannas studios, with Mig Seco at the desk. We still have some parts to record, but we're now close to completion. The most recent session was 08/09/12. 1912 have contributed an edited version of a new song called "Brick By Brick". The full version of the song will be included on 1912's 2nd album, currently being recorded. It should give a good taster of the music coming up from 1912 this year. A&C should be an exciting release for all the bands featured on it. Go to www.omenopus.com to order your copy. The 1912 song "Please Take Me Away From Here" features on a new FREE compilation CD, put together by our good friend and "Omenopus" mainman Lee Potts, and launched on 4th April 2011. The CD is called "Allies & Clansmen", and includes contributions from many of the artists who know or have worked with Lee over the years.